Although on the surface the 2018 Normatec Pulse looks and functions just like the original Normatec Pulse (2015-2017), there are some nice upgrades to the new unit that are not clearly visible and marketed, but nonetheless are beneficial to the customer. Normatec has been shipping what I am calling the "Gen 2" 2018 Pulse since at least November 2017 so if you bought one direct from them you probably have it, but I thought I would take the opportunity to highlight a few key benefits of the new 2018 system. My thoughts on this 2018 unit are my thoughts after 6+ months of use with 80+ hours of runtime. I can definitely say that this is the best Normatec Pulse unit yet and fixes the battery issue which was the one gripe I had with my original Pulse. 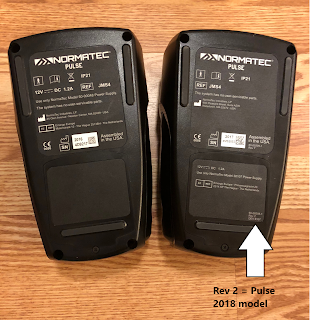 It is worth mentioning that while I discussed the battery limitation in my original review of Normatec vs Air Relax, I have since updated that article to reflect the improved battery. This isn't a complete detailed review of the Normatec system akin to the likes of DCRainmaker's Garmin reviews, but I am happy to answer any questions you have. Improved Battery - The old Normatec Pulse had a battery that was always in a "low-power" mode even when off. This led to situations where you might charge the unit but it was dead when you went to use it. This was highly annoying if you were traveling and didn't have access to power outlets such as in an airport, in the car, or on a soccer field. This issue has been fixed in the 2018 Pulse. Enhanced Durability - The legs have been reinforced further making them stronger to handle the continuous cycle of expanding, holding pressure, and decompressing, and then doing it over and over, for weeks, month, and years. This may not seem like much, but every pro athlete I know depends on their recovery compression boots to get them thru their biggest training blocks. Failures do happen and it is nice to know that Normatec has worked on increasing durability. Increased Warranty - With the durability enhanced, Normatec was able to extend the warranty from 1 year to 2 years. However, if you have an AMEX card then I highly recommend using it for this purchase. AMEX will double your warranty for free which increases the warranty to 4 years. I have gone thru their claim process a couple of times (usually with Garmins) and it is a great benefit to cardholders. Decreased Price - Despite the improvements, the new 2018 Normatec Pulse is more affordable than ever. Normatec has been reducing the price of the Normatec Pulse over the past few years. While originally it was priced at $1695, it is now $1495. With a readily available discount of $100 that makes the standard pricing effectively $1395. Along with testing the battery to make sure it held a charge over extended periods of time, I also wanted to test battery life. This test was conducted after many months of use and charge/discharge cycles. Battery life will vary on boot size, pressure level, and your own leg size. Personally, I got 2 hours and 51 minutes at level 5 (max is level 7) from a standard set of legs. Normatec claims 2 hours of battery life. Normatec was originally designed for patients with leg edema (swelling). I don't suffer from edema, but I figured I would test how much difference it made on otherwise healthy legs. As a reminder, Normatec leg sleeves come in three sizes. Keep in mind it is not only the leg length but also the width that is affected. Short for under 5' 3"
Tall for people over 6' 4"
One can easily determine which Pulse they are getting via a sticker on the back of the unit. You want to see a manufactured date of 2017 or later, plus a sticker at the bottom, with a "Rev 2". The 2018 Normatec Pulse is a nice upgrade to a system that was already very nice. Never in my life has a product category been embraced by so many professional athletes in so many sports, including triathletes, marathoners, cyclists, cross-fitters, NBA, NFL, NHL, golf, tennis, soccer, lacrosse, track and field, and even Hollywood celebrities (Snoop Dogg included). The overwhelming majority of these athletes aren't being paid for their endorsement. Lebron James is probably the biggest sports name and it was reported he spent $3 million dollars in 2017 on his recovery. Personally, as a tinker but minimalist, I have been surprised by how often I am willing to travel with recovery compression boots. They simply go everywhere with me and I write this as I am in them. While there is still a place for many other recovery modalities in the athlete toolbox, no tool is as convenient and relaxing as recovery compression boots. They are just too easy to get into and I really do believe they help athletes recover faster and feel fresher. I believe the best recovery tools are the ones that don't seem like a chore and recovery compression boots are definitely not a chore to me. For those that are looking for a more affordable set of boots please take a look at my original Air Relax vs Normatec review. Air Relax is a competitively priced system that has also become the choice of many champions and in many sports. Some triathletes using Air Relax include Ironman Champions Romain Guillaume, Jozef Major, Guy Crawford, Kate Bevilaqua, and Susie Cheetham (6th at 2017 Ironman World Championship). When companies have competition the consumer wins. Normatec, Air Relax, and Rapid Reboot will all help push the boundaries of what the human body can accomplish.